He certainly got everyone's attention. Wow. Sal Valentinetti took the America's Got Talent Stage and belted out "My Way" by Frank Sinatra. He performs the song in a fashion that would've made Sinatra, himself, proud! There were no fancy bells and whistles, no special effects or dance routines - just a man on the stage with his incredible voice. Every single one of the judges were blown away by the end of his performance, and Simon even said that he could tell Sal felt this style of music in his soul! 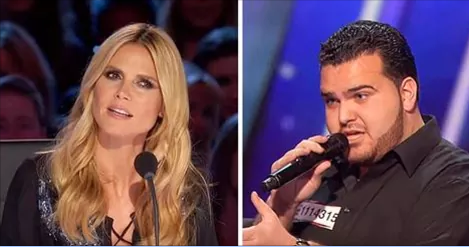 The rest of the judges agreed and Heidi gave him the biggest surprise of all: the Golden Buzzer! "This is the first day of the rest of my life," Sal exclaimed during the gold confetti shower. We love his voice and can't wait to see what this season has in store!